The sewing machine needle is the most important part of the sewing machine (and generally the cheapest). It is recommended that you change your needle often in order to prevent it from breaking or creating poorly formed stitches. 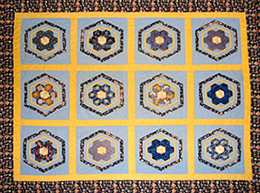 Many quilters will go through a number of needles when making a large quilt. Machine quilting needs a sharp needle to easily pierce the three part quilt sandwich and properly sew together the quilt top, batting and backing. Schmetz needles are very popular machine quilting needles. They are available for both thick and thin quilts and are compatible with a variety of different threads. These days, with due credit for fantastic modern technology, quilters using quilting machines have a lot more control over where their needle goes. In the past quilting using a machine has been a little more straight forward (literally) than hand quilting as there has been little flexibility. However, there are now machines designed solely for quilting and these allow the quilter to use stippling and other quilting techniques fairly easily and give a very professional finish to the quilt.